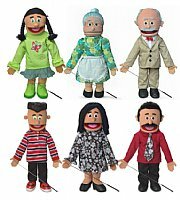 Each of our 6 silly kid puppets are wonderful muppet mouth puppets, they stand about 25" tall. Their mouths are very easy to move. Hand is inserted through the back of the puppet (ventriloquist style) to operate the mouth. These are great for people just starting out with puppetry but don't want to invest just yet in the Full/Half Body puppets.